It never ceases to amaze me how powerful modern laptop computers are, to the extent that, unless you're a gamer, they're more than a match for many desktop systems. 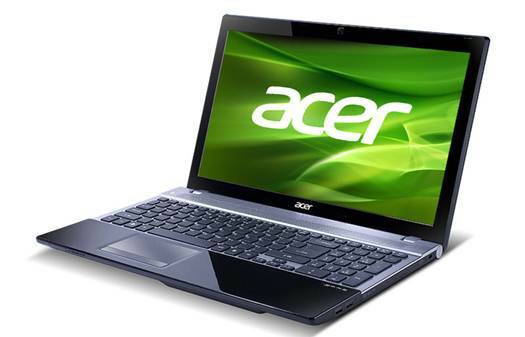 A classic example of this must be the Acer V3 series, which depending which model you go for can offer impressive performance levels. The V3-571 model that they sent me for review has 'Intel' running through it like 'Blackpool' goes through rock, using the Intel Core i5-2450M processor and Sandy Bridge HM77 Express chipset. That's a dual core CPU with hyperthreading and its wired to 6GB of DDR3 RAM, exploitable through the preinstalled Windows 7 Home Premium 64-Bit. It also has a 500GB hard drive, DVD-RW and a very fine 15.6" CineCrystal active matrix LCD panel that offers good viewing angles and a super-sharp image. In terms of other boxes to tick you can include Bluetooth, HDMI out, Gigabit Ethernet, Webcam, full numeric pad keyboard and even USB 3.0. The six cell battery promises 4.5 hours of use, which should be enough for most compute journeys without access to mains power. After using the V3 for over a week now, I can say with some authority that it delivers on most of the specification promises, even if the shiny case finish attracts fingerprints like an Apple iPad. However, even the best products have drawbacks, and I found a few minors ones beneath the surface of this otherwise excellent machine. The first annoyance is the mouse keys below the touchpad, which don't operate cleanly or consistently. This is a simple fix, I'd imagine, so Acer should sort this out soon one hopes. Another problem is more difficult to address; the integrated Intel HD Graphics 3000 video hardware. Despite what Intel says, the GPU hardware doesn't compare well with the mobile NVidia GeForce or AMD hardware. If you play the occasional game I'd punt for the GeForce upgrade that some Aspire models offer, because Intel's 3D graphics aren't great and they don't support DX11 in this version. For business users who aren't fighting the World of Warcraft this is a very attractive machine that has plenty of power and lots of desirable feature, not least the price. It might not be the latest Ivy Bridge solution, but it's more than a respectable performer. Spend a little more on a V3 and you can have a Core-i7 CPU, 8GB of RAM and NVidia graphics, or working to a tighter budget you can knock another $160 of this price by going with a lower specified Core-i3 instead. Whichever in the series you choose this is an impressive piece of hardware that does the reputation of Acer no harm at all.